Inspired the by the studies of UFOs, aliens and the artifacts of in our solar system plus being witness to UFO activity (full details below), PYRAMIDS ON MARS is an embodiment of spacey music that brings both worlds together as both a musical concept, and message to the world of the alien presence. 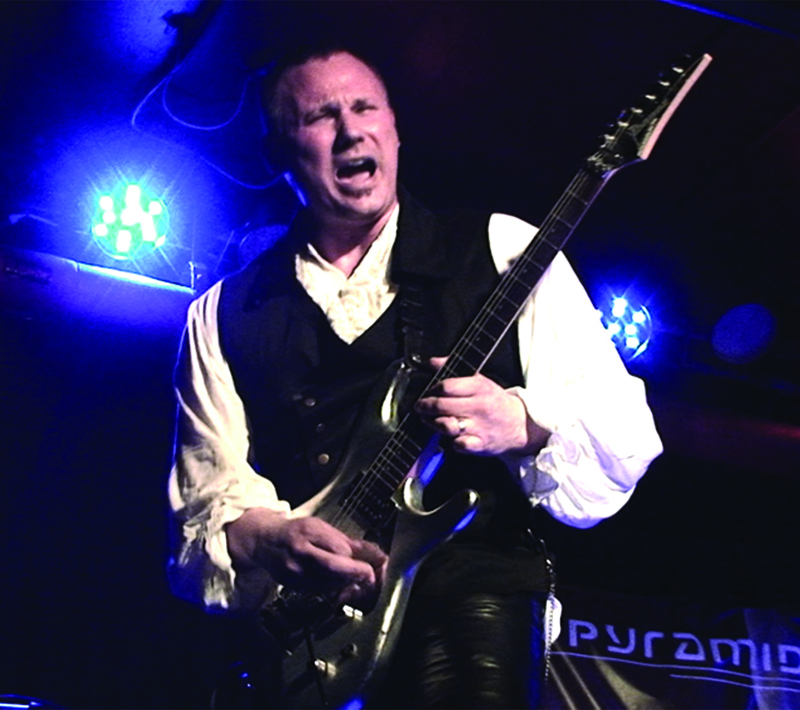 Formed in 2011, PYRAMIDS ON MARS is the solo creation of guitarist Kevin Estrella who offers an aural palette of intense, emotional, 3-dimensional, heavy and melodic progressive rock/ metal that includes a range of influences such as Baroque classical guitar, classical composers J.S Bach and Antonio Vivaldi along with today’s guitar virtuosos Yngwie Malmsteen and Joe Satriani. “I honestly think “Echo Cosmic” will do for this decade what Joe Satrani’s ‘Surfing With The Alien’ did for instrumental rock back in the ’80’s. It captures the same passion, energy, and melodic hooks, yet it has an updated sound. Heavier than Satriani though. He is influenced mostly by the blues. I am influenced by metal and classical music. I have always focused on melody. Same with composers like J.S Bach and Antonio Vivaldi. The masters of melody. They are pretty much all I listen to. So what I am doing on stage today, was the norm 300 years ago. ” comments Estrella. Featuring ten tracks of emotionally high energy music that mostly came to life in Estrella’s dreams over the last two years, the album as whole pays homage to some of Estrella’s biggest influences while still staying true to himself and his own creations. “On Echo Cosmic, I wanted to put more emphasis on the rhythm guitars, bass and drums. The keyboards are still there, but they play more second fiddle sort of speaking. Some songs are stripped right down to just bass, drums and lead guitar. I wanted this album it to be more in your face with less clutter.” says Estrella. “The writing on this album is also inspired by the bands I love the most. I love so many bands and love so many styles. So, I tend to write in whatever style I want to. There are so many other band styles I want to explore. I am probably one of the most unique bands out there that I have no one particular ‘sound’. 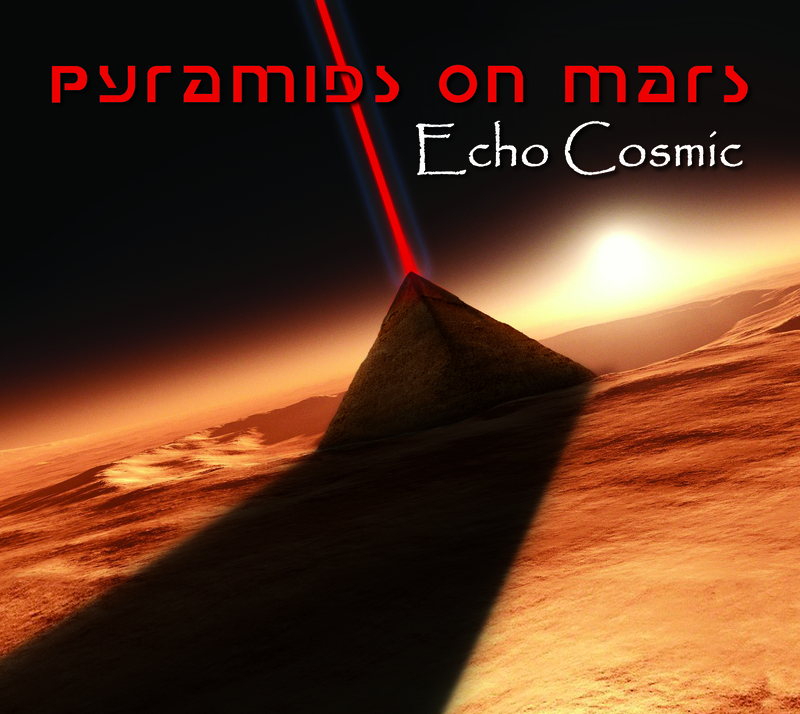 But all the songs have a common thread/element that identifies them as being Pyramids On Mars. I think I have an advantage others do not have, because I can transform like a chameleon.” says Estrella. “To summarize, the overall story line of ‘Echo Cosmic’ is about mankind’s history of broadcasting radio and tv signals for over 100 years from earth to space. Theoretically, some of these signals should be picked up by alien civilizations. We are announcing our existence through this cosmic echo we are sending out. We may be an insignificant species in a vast universe, but we are leaving a footprint that has infinite infuence.” comments Estrella. 1. Dream Division: The whole introduction I heard in a dream. Started off simply with guitar, but got more interesting when the bass and drums join in and are all doing something different from each other. But it all worked. Almost like division. Thus the name. 2.Battle for Rome: Influenced by the X-Box One game trailer Ryse Son of Rome. Watch the trailer, and you can imagine this song playing in it. 3. Death Valley Driver: The main rhythm guitar and drums were bedtracks for this song. Reminded me of driving fast on a desert road. 4. Tribute: I was experimenting with some ’80’s guitar tone presets. Improvising, I played the main rhythm part. It sounded like something Randy Rhoads would play. Decided to write a song dedicated to him. 5. Heaven’s Gate: Influenced by a band who has a a dead guy with leather skin for a mascot. 6. Sailing the Ocean’s of Neptune: Heard the main riff in my head for weeks. Finally wrote the song. Had a real Hendrix feel to it, with a large Extreme influence. 8. Order of the Freemasons: Song written back in 2011. A very dark song about a dark subject. It is more a work of art rather than being a radio friendly song. A song I am very proud of. 9. Occam’s Razor: A fast, thrash metal song with sharp, jagged teeth. You will hear at least three metal band influences in this one! 10. Echo Cosmic: The flagship of the CD. A song that creates a feeling of loneliness and isolation. That which we are in this vast universe. – August 21, 2014 @ 10:30pm, a 2 dimensional disc approx. 40 ft in diameter, surrounded in orange/red plasma appears over the City of Hamilton. He immediately files a full report with MUFON. (full report here)- 2015 Kevin Estrella attends the Alien Cosmic Exhibition (ACE) in Brantford, Ontario. He meets with MUFON investigator Stu Bundy who took his report. They are very excited to see him. They are doing a presentation at ACE that includes his sighting. They deem it to be AUTHENTIC.- What is drawing attention, is from official UFO database reports, there is no record of any UFO sighting in the city of Hamilton the night of August 21, 2014.HE IS THE ONLY ONE WHO WITNESSED IT.- He personally meets with world respected Ufologist, Grant Cameron to discuss the matter. He says this phenomenon is not uncommon; where one person is witness to a sighting and others around do not see it. He went on to explain how the same thing happened to John Lennon, in New York City.- Grant has done extensive research into the subject of the UFO/alien phenomenon and its particular interest with musicians. Many musicians have come forward and have had personal alien/UFO encounters, and are getting musical ideas through downloads. Estrella discussed with Grant how he too, gets songs from dreams and nearly all his music seems to come from channeling into an energy source from elsewhere. The alien rock stories Grant talks about in his presentation sounds much like Estrella’s own personal experiences. That is what drew him to attend ACE in the first place.- Grant is under the notion that the fact that no-one else saw it, this UFO sighting was meant for Estrella to see.- Estrella is lead to believe the UFO/Musician connection Grant speaks of, He is a part of this group.